– The vaccine is prepared in embryonated eggs injected with the lentogenic strain LaSota, containing at least 108 EID50 inactivated and suspended in light mineral oil adjuvant. – It is selected for its long lasting immunity. 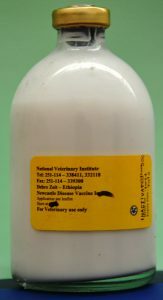 – The inactivated type vaccine is recommended for flocks of laying and breeding birds. – The vaccine is injected 0.5ml/bird subcutaneously at the back of the neck or intramuscularly in the breast muscle. – First Vaccination 10 – 12 weeks of age. – Second Vaccination is given at point of lay. – Best immunity is obtained when birds are vaccinated with live Newcastle vaccines prior to the application of inactivated vaccine. – Store the vaccine in a refrigerator at a temperature of 4 ºC to 8 ºC until it is used. – Before use allow the vaccine to reach at room temperature (20 ºC), and shake well before and during use. – No local post – vaccinal reaction occurs, but trace of oil may be found for some time at the site of injection. – Accidental injection of this vaccine to the user (professional) can cause localized reaction for which physician advice should be sought at once, informing him that the vaccine is an oil emulsion.